To stop his father, Troy will have to destroy the Crown of Stones. But to do that, he needs to understand its origins and that of his people. Delving into the past of the Shinree, Troy shall uncover truths lost over the centuries of slavery and catastrophe. But will it be enough to let him defeat his father? Or will Jem Reth dominate all the lands of Mirra’kelan and usher in his grand ambition to be Emperor. Everything the trilogy has been building for reaches its peak in this book. Schneider reveals all the secrets of the Shinree past, pulling back the mysteries and giving Troy a choice. The book is packed with action, danger, and suspense. The first person narrative once again propels the book with a sense of immediacy, placing you in the action. With a bittersweet ending, Magic-Bourne is a satisfactory closing to the trilogy, building towards its climax with a breathtaking intensity. The plot twists and turns but Schneider doesn’t lose her way and guides you to its ending. This is an amazing series. 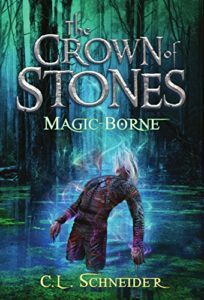 If you’re a fan of Fantasy, then you should read this book. Plenty of action, plot, drama, and more to satisfy your craving. One last time, we plunge into the world of Mirra’kelan! You can buy Crown of Stone-Magic Bourne from Amazon!